The pro se information on the Court's website is specifically for individuals who are representing themselves in the Eastern District of North Carolina without the assistance of an attorney. It is intended as an informative and practical resource for pro se litigants, and is not a substitute for legal advice from an experienced attorney. The information is procedural in nature and should be read in conjunction with the Federal Rules of Civil Procedure, the Local Rules of this Court and the individual practices of the judge assigned to your case. Moreover, the links to other websites are for informational purposes only, and neither the United States District Court Clerk's Office nor any employee of the United States District Court for the Eastern District of North Carolina is responsible for the accuracy of the information contained in other websites. If you wish to start a civil action in federal court, but do not have an attorney to represent you, you may file your case yourself. This is called "proceeding pro se" which is a Latin term meaning “for yourself.” You will then be called a "pro se litigant." You need not worry if you have had little or no experience with the courts before. You are, however, expected to follow/abide by the rules that govern the practice of law in the Federal Court. Pro Se litigants should be familiar with the Federal Rules of Civil Procedure and the Local Rules of this court. Please visit the Rules section of this web site to review the rules in detail. A civil case, which is the only type of case you can commence in federal court, is different from a criminal case, which can only be commenced by government officials. In a civil case, you do not have a constitutional right to appointed counsel. 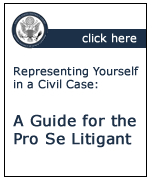 Therefore, if you start a civil case pro se, you should be prepared to pursue it to completion on your own.